Market research (MR) is always interesting, sometimes eye-opening, and occasionally vastly entertaining; it is a few of the entertaining situations observed by my friends and I that I am describing below. Often people complain that market research is useless because people do not do what they say they will do. Quite true, and that is why observing and making inferences from actual behaviour in various environments is so critical. Once though, we didn’t even need to enquire about a respondent’s past behaviour, or observe her daily routine and purchase pattern in order to spot the anomaly, it was quite evident during the interview itself. This interview was being conducted to understand health – consciousness and related habits; it was being recorded on camera and we were watching it on a TV in another room. Right at the outset, the respondent claimed to be very health conscious and careful about what she ate, but she was more than a bit overweight, that gave us observers the first reason to doubt her claims. There was about 30-40 minutes of discussion around the work she does, where she shops, the kind of products she buys, etc. At some point, the young lady started feeling hungry, proclaimed that she’d had a very busy day, rummaged about in her handbag, took out a bar of chocolate and proceeded to eat the entire bar! Not five minutes after she had earnestly told the interviewer how she prefers to buy juice rather than aerated drinks for health reasons, and eats a lot of fresh fruit regularly! Yes Ma’am, we believe you. Picture a focus group composed of middle-aged women, being conducted for a company marketing a regular consumer product – say a soap, powder or detergent bar. At some point, the respondents are asked about the reasons for selection of a brand, how their preferred brand is better than other brands, do all members of the family use the same brand, what do the others like, etc. Then the discussion veers around to which brands the husbands like, product attributes that the husbands prefer, and how they influence their husbands. At this point, one woman throws a googly into the discussion that leaves the moderator and the observers totally stumped. She coyly explains, “main bachhon ko kisi aur ke ghar bhej deti hoon aur unhein ‘khush’ kar deti hoon” (“I send the kids out to someone else’s house and then make him ‘happy’”). Disclosing this to a group of strangers during a discussion on quite an unrelated topic, this woman was either more frank than the rest, or worked harder at influencing her husband! And if you thought that only the respondents were entertaining, it’s not so, often one’s own colleagues prove themselves capable of providing dollops of entertainment too! Market research with Mr. Maths; a young enthusiastic colleague, eager to use the Logic and Quant fundas obtained through years of rigorous study at a premier institution. One of our respondents answered the questions put to him by Mr. Maths as best as he could, but his answers did not tally too well with his stated income. Our intelligent inquirer, on the other hand, would permit no falsehood and insisted on understanding how the respondent could afford to pay Rs. x as EMI when his annual income was actually ‘only’ Rs. y and expenses were as at least as high as Rs. z. Not a conversation anybody would enjoy, and understandably, our respondent’s temper began to rise and the tone of his answers grew sullen. After a few minutes of this, the interpreter decided that he’d rather intervene now than be stuck in a police case later; he gently pulled young Mr. Maths aside and pointed out two salient facts – a) the respondent was known to be very hot-tempered and often got violent when annoyed and b) he was known to carry a weapon. Survival instinct trumped the urge for data-gathering and that interview came to an abrupt end. Diligently covering every bullet point from the discussion guide, he asked a poor farm labourer whether he would like to improve his living conditions and quality of life; this, when they were standing in front of the labourer’s hut which had been battered by several monsoons and was visibly close to falling down, and the labourer’s several malnourished stick-thin children stood nearby. Unfortunately, Mr. Diligent also knew the local lingo so there wasn’t even a translator who could modify the question and make it less frustrating. The labourer, tired at the end of a hard day, decided that he had endured enough inanity for one evening. He pointed at his house behind him, said, “aankhen hain tho khud hi dekh lo” (“if you have eyes, then see for yourself”) and walked off muttering to himself, casting aspersions on both the young man’s education and his intellect. And sometimes the research venue is entertaining enough. For some product testing research in the South, the venue was the big hall of a Kalyana Mandapam (marriage hall). It was simply surreal – five sets of tables and chairs were set out in the hall, where various respondents sat trying out different products and giving their opinions about them. Beaming beatifically down on everyone as if blessing them were portraits of happily married couples, complete with big floral garlands; in between were scattered statues and sculptures of various gods and goddesses. Quite an auspicious venue for a research, wot! And, of course, we had a stage, with an arch covered in plastic flowers – in case the product got a thumbs up from respondents, the company folk had the option of breaking into an impromptu victory jig, there was even a sound system available to provide musical accompaniment. The consumer may not always be logical, but understanding his/her thought process is critical to success. Consider an example. Real Junior juices were launched in 2004 and were targeted at children under six. The juices came in a smaller size (125 ml; the school packs were 200 ml), 2 flavors – Mango and Apple, enriched with calcium, and promised low acidity. The vibrant packs with animated fruit characters were intended to appeal to children by highlighting the taste and nutrition of Real Junior. Despite the different marketing efforts and clear benefits for the children, the brand did not contribute much to the business and was pulled back from the market in 2006. We think, back in 2004, the market was just not ripe for health foods. It is only recently that this health and wellness foods and beverages market has opened up so much because now people have gotten more aware of health problems and perhaps now would be the right time to launch such a product. Also, during our research on the connection of health and wellness benefits from various products and formats, when asked about the connections they make of nutrients with their source, the consumers said, “Juice with calcium makes no sense, if a milk-based product made a calcium claim, it would be easier to believe”, “If this product had bananas or milk mentioned in it, it would be easier to associate with the calcium claim, juices are associated with vitamins.” In fact, it was after hearing this that we scoured the market landscape for examples of various products that claimed a health benefit from calcium fortification and found the Dabur Junior Juice example. But the question to ask is whether Indian households are ready to buy separate products for different members of the household or would much rather prefer a common product that meets everyone’s needs. If you look closely at the recent of Dabur Real ads – the key target are the children in the first and the entire family (child, mumma and dadoo) in the second – but the hook/ the first adopter of the product is the child. So does Dabur really need to segment the market basis age groups or should it stick to its more successful strategy of segmenting basis benefits (Real Juice vs. Real Active)? What do you think? Why do most people fall short of their intentions? Do they try and then give up, or not even try? What do they do in order to stay healthy? This post explores the answers to these questions. Most people fall short of their intentions for one key reason – ‘the man~ana factor’. ‘Man~ana’ is Spanish for an indefinite time in the future, tomorrow or sometime later; ‘the man~ana factor’ is our term for procrastination, an attitude described with a lot of wit and a fair bit of accuracy in a popular song from decades ago with the refrain ‘man~ana is soon enough for me’. While they are aware of long-term health problems and maintaining good health is important to them, most people don’t see it as a key problem for themselves; a previous post titled ‘everybody says I’m fine’ had described this attitude. Hence, while they intend to do something about it, it isn’t critical except when they are feeling unwell. As a respondent pithily expressed the fact that practising healthy habits is limited to when one feels unwell,“takleef gayi tho buri aadatein shuru”. Now add to this the fact that time is a commodity in short supply in everyone’s lives, and you know why intent doesn’t translate into action very often. The people that do exercise regularly are of two types. One, those that are extremely health conscious or appearance conscious – this is the sliver of the population we’ve referred to in multiple posts (here and here). In addition, a chunk of this regularly exercising group is those that already have some health problem and need to manage it, for instance, those that have back pain and do yoga regularly, or those that have diabetes and walk every morning. Often, the shock of having and suffering from the ailment is the wake-up call that jolts them from a state of intent to one of action. Women often exercise even less than men do; one, the belief that housework itself constitutes sufficient exercise and two, a tendency to put anything related to themselves right at the bottom of their list of priorities. Even women that do take care of their health sometimes feel the need to rationalise it as necessary in order to ensure that they can take care of the rest of the family; as one woman expressed it, ‘agar tire hi achhi nahin hai, tho gaadi kaise chalegi?’ (‘if the tyres aren’t in good shape, how will the vehicle run?’). Yoga and walking are the preferred modes of exercise amongst women that do exercise regularly; one wonders whether the reason for the popularity of these two is that neither requires special equipment or surroundings, both of which would mean spending on themselves. Women either wake up early to do yoga (we’ve actually met women that got up at 4 a.m. in order to do an hour of yoga before their daily chores begin!) or do it in the afternoon. Yes, the spurt in the number of yoga channels such as Baba Ramdev’s has added to the popularity of this mode of exercise. Walking is another popular method, though they often cheat their conscience by accepting hot weather / rainy weather / cold weather, in fact, anything less than perfect weather as an excuse for not stepping out. One exceptional lady we met in Bombay though, solved this problem by deciding not to travel via vehicle to any place that was within 2 hours of home – so she walked to the grocer, walked to work, walked to her children’s school, etc. and this kept her fit as a fiddle. Given the lack of time to exercise, most people rely more on controlling their diet – or trying to – than on regular exercise. Most people, both men and women, believe that eating fresh home-cooked food is one of the best things to maintain good health; hence being on a healthy diet is something that is not too difficult, except for those that have a job that involves travel. Within this broad framework, housewives also recognise the need for some amount of control, so they try to moderate the amount of rice, sugar, oil, etc. they consume and use for cooking, and to increase the amount of green leafy vegetables and cereals consumed. Sometimes leading to frustrating results; as one lady told us, her husband complained about the amount of oil she used and its effects on his health, but when she made parathas with less oil, he refused to eat them as they weren’t tasty enough ! Her solution, to make the parathas with ‘enough’ oil and then dab them with a paper napkin before serving them so that no oil was visible ! 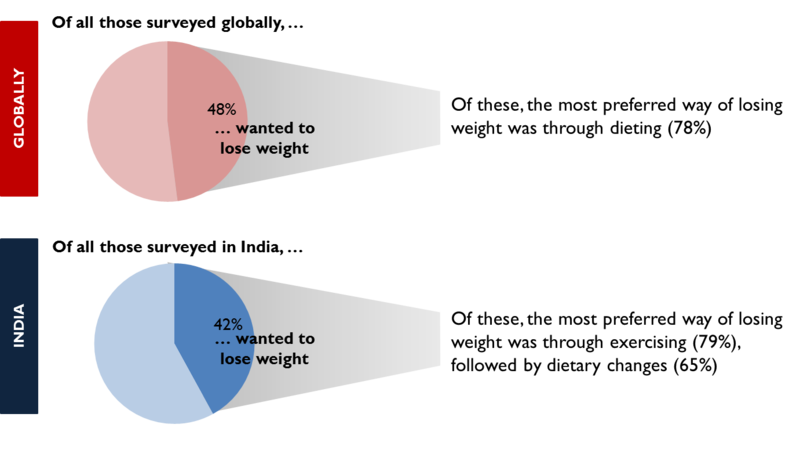 Unlike the belief that they are getting a reasonably healthy diet, most people recognise that they are getting nowhere near the required amount of exercise. Concerns about this cause a heightened awareness of exercise solutions available, and probably an over-stated intention to exercise in order to stay healthy as seen in the survey. Before ending this post, let me mention that while most people believe that their diet is reasonably healthy, they also believe that they need to tweak it slightly in order to address certain specific health issues. Understanding which health issues these are and creating offerings that address them has been the key to many a successful product launch in the past, and it is only this understanding which can lead to the high growth rates that have been estimated for this sector. In our previous post , we spoke about the recent Nielsen Study that explored the health-conscious sliver of the population and some of their attitudes. One thing that jumped out amongst the findings of this study was the difference in preference of method to lose weight between health-conscious Indians and westerners. The preferred method of losing weight globally (i.e. western countries) is through dieting while in India it is through exercising. These results got me wondering — why is this the case? Even if, as mentioned in the last post, we interpret the survey results as a reflection of intent and not actual practice, one still wonders about the reason for the difference. Are these reflections of the social, cultural and economic conditioning of these populations? Or is this a reflection of the current market forces? What do you think is the reason for this difference? Do write in to us and share your views. To be continued in the next post ….